By the time she dies at age 106, Esther Gottesfeld, the last survivor of the Triangle Shirtwaist fire, has told the story of that day many times. But her own role remains mysterious: How did she survive? Are the gaps in her story just common mistakes, or has she concealed a secret over the years? As her granddaughter seeks the real story in the present day, a zealous feminist historian bears down on her with her own set of conclusions, and Esther's voice vies with theirs to reveal the full meaning of the tragedy. A brilliant chronicle of the event that stood for ninety years as New York's most violent disaster, Triangle forces us to consider how we tell our stories, how we hear them, and how history is forged from unverifiable truths. Katharine Weber is the author of the novels The Little Women (FSG, 2003), The Music Lesson, and Objects in Mirror Are Closer Than They Appear. 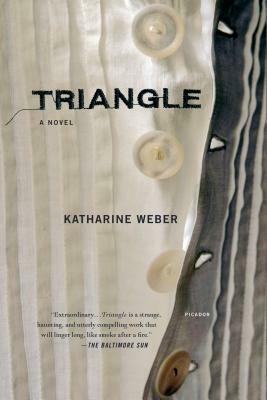 Her paternal grandmother finished buttonholes for the Triangle Shirtwaist Company in 1909. Reread the poem by Robert Pinsky that opens the novel. What do you make of the way the poem blends past and present? In what way do various forms—poetry, journalism, scholarly books, musical compositions, fiction—complement one another in documenting history? What echoes did you notice between Pinsky’s poem and the Triangle Oratorio with which the novel concludes? What similar reverberations occur throughout the novel? What assumptions did you make about Esther after reading the recollections that form the first chapter? How did your perception of her shift throughout the novel? In your mind, what do George’s compositions sound like? What was the effect of reading about the medical aspects of his music? In what ways does this mesh with the legacy of loss in Rebecca’s ancestry? What are the benefits and shortcomings of Rebecca’s DNA research? How does it affect her relationship with George? What does George’s failure to have a cell phone indicate about his character and sensibility? In what way does George’s music weave science and technology into traditional and classical forms? In the interview transcript featured in chapter four, what new details emerged that you had not noticed before in Esther’s initial retelling of the Triangle fire? What defines her immigration story? The profile of George, comprising chapter five, includes his own take on the cadences that inspire his music. What does this interview, alongside the one between Ruth and Esther, tell us about the various ways we view our own lives? If a reporter were to interview you about a significant incident in your life, what facts would have to be conveyed in your own words? What experiences would a reporter likely misinterpret? What was it like to finally “hear” Ruth’s voice in chapter eight? What conclusions had you drawn about her before she was given a voice in the novel? What is Ruth right about? What are her shortcomings? Why are Esther and Rebecca so resistant to viewing the fire through the lens of feminism? Chapter eight opens with the inaccurate news story that reports Esther’s death. What is the effect of her death date and its proximity to 9/11? What parallels exist between the Triangle tragedy and 9/11? In chapter nine, Rebecca tells her therapist about the few memories she has of her father, realizing “she believed that her father wouldn’t have died in the car accident along with her mother, that they would both be alive today if it were not for the Triangle fire. But Esther herself would have died years ago had she not been so busy surviving the fire so effectively.” What universal qualities exist in this line of thinking? What is it like to be a survivor? What patterns does the mind discover in the randomness of tragedy? Was the death of Rebecca’s parents “random”? Or the death of Morris Jacobs, in a fire no less? How did you interpret Esther’s habit of wearing eyeglasses that didn’t perfectly correct her vision? What did you make of her comment, paraphrased by Rebecca in chapter thirteen, that “it was so she could see the world a little blurry on purpose”? Why didn’t Esther spend any of the money she received secretly after the fire? How would she have responded to the Triangle Oratorio? What causes the shift in Rebecca and George’s relationship, leading to marriage and a child? How much knowledge of the Triangle Waist Company fire did you have before reading Triangle? What details about the fire surprised you? What is the effect of reading a book that blends historical fact with fiction? Had you pieced together the truth by the time you reached the novel’s closing scenes, when the realities of Esther’s and Pauline’s experiences at the factory are revealed? What choices would you have made in Pauline’s situation? What are the key events in your family history? What discrepancies exist in the various accounts of it? To what do you attribute those discrepancies? Are there artifacts such as letters, legal documents, or family photos like the ones in the novel that could reveal family secrets or hidden truths if examined more closely?